The British also purchased the 5,000 ton Admiralty X floating dry dock from the Dutch East Indies in November, 1939. Built in the Netherlands 1924 and moved to the Naval Base Singapore, this smaller drydock was to be used by cruisers and destroyers, so that the larger drydocks would be available for any capital ships. Singapore's commercial Keppel Harbor is naturally sheltered with deep waters. In 1832, Captain Henry Keppel came to Singapore and helped to clear the Straits of pirates. While based at Singapore, he discovered and surveyed the deep water anchorage. In 1859, Captain William Cloughton built the first dry dock known as Number 1 Dock. In 1868, the second dock, Victoria Dock, was opened followed by the Albert Dock in 1879. The harbor was renamed Keppel Harbour in April 1900 when Admiral Keppel visited Singapore at age 92. With the impending capture of Singapore by the Imperial Japanese Army in 1942, the King George VI dry dock gates were blown off and machinery destroyed. The dock was subsequently repaired and used throughout the war. There was also a floating crane nearby. On 15 February 1942, at the Ford Motor factory on Bukit Timah Road, LtGen Arthur E. Percival, General Officer Commanding, Malaya, surrendered Singapore to Japanese LtGen Yamashita in the largest surrender of British-led military personnel in history. About 80,000 British, Indian and Australian troops become prisoners of war, joining 50,000 taken in the Malayan Campaign. Prime Minister Winston S. Churchill calls the fall of Singapore the "worst disaster" and "largest capitulation" in British history. On 24 February 1942, the former Royal Navy Base at Seletar was taken over by the Imperial Japanese Navy. Both floating dry docks had been scuttled by the British, but were raised and re-used by the Japanese. The IJN No. 101 Naval Construction and Repair Departmentt was established under Rear Admiral/Eng, (later Vice Admiral) Akasaka Isao (21) who was appointed as its prospective Director on 15 December 1941 and then served from February 1942 to 1 May 1943. The No. 101 Naval Construction and Repair Department had a staff of officers (engineers, technical and administrative staff), naval ratings and uniformed technicians. The dockyard also had local Chinese, Malay and Indian workers, and British prisoners-of-wars (POW). Most of the yards’ workers initially were employed on repairing sabotage carried out by the British Navy. On 13 March 1942, IJN converted repair ship ASAHI, a former 15,374-ton SHIKISHIMA-class battleship (1900) arrived at Seletar Naval Base, Singapore. ASAHI was equipped with only simple equipment and machine tools that limited the repairs she could perform, but in April she performed repairs on light cruiser NAKA. In 29 May 1942, N of Borneo, submarine depot ship RIO DE JANEIRO MARU was hit by a torpedo, probably fired by USS SWORDFISH (SS-193), that tore a 46' x 26'- hole in Hold No. 1. IJN repair ships YAMABIKO MARU and KASUGA MARU arrived on scene and towed RIO DE JANERIO MARU to Singapore for repairs. On 23 December 1942, IJA landing craft depot ship SHINSHU MARU, sunk in February at Bantam Bay, Java, was refloated and temporaily repaired at Batavia, Java, and arrived at the No. 101 Naval Construction and Repair Department where she underwent repairs until 6 May 1943. In 1942, among the warships that received repairs and maintenance at the Seletar Navy Base were cruisers CHOKAI and ASHIGARA. Both were drydocked for hull repairs, scraping and repaining.. Auxiliary gunboat TAIKO MARU, heavily damaged by a hit in the engine room by an RAAF air attack, after undergoing temporary repairs, was later towed to Singapore for permanent repairs. On 1 May 1943, Rear Admiral/Eng Kato Yoshio (23) was appointed Director of the No. 101 Naval Construction and Repair Department and served until 1 February 1944. On 3 June 1943, IJN tanker PALEMBANG MARU arrived in tow at Keppel Harbor's Mitsubishi Jukogyo K.K. Shonan Zosensho and was docked for inspection and repairs. A survey revealed serious damage to her machinery which required new parts from Japan. Many months later the required machinery parts arrived from Japan. The repair work progressed slowly, but was finally completed by mid-November. During World War II, Lingga Roads, a sheltered anchorage in the Lingga Archipelago south of Singapore, was used as a fleet anchorage by major units of the Imperial Japanese Navy so that these ships were near a source of fuel. It was from Lingga Roads that the main Japanese southern striking force deployed for the Battle of Leyte Gulf. In 1944, among the warships that received repairs and maintenance at the Seletar Navy Base were battleships NAGATO and FUSO, fleet carrier ZUIKAKU. All were docked in the former King George VI Drydock of the 101st Naval Repair Facility. Cruiser CHOKAI, storeship ARASAKI and auxiliary supply ship NICHINAN MARU underwent repairs and upkeep. On 1 February 1944, Captain/Eng Ishikawa Yuzo (25) was appointed and served as Director of the No. 101 Naval Construction and Repair Department until 5 April 1945. Ishikawa was promoted Rear Admiral on 1 May 1945 and served as Director until war’s end. On 13 September 1944, German U-boat U-862 arrived at the Seletar Naval Base from Penang, Malaya. A few days later, U-862 was drydocked at the No. 101 Navy Repair Unit. Hundreds of flasks of mercury were removed from her keel and replaced by molybdenum and tungsten for export to Germany. In November 1944, cruisers MYOKO and TAKAO arrived, but both were deemed unrepairable at Singapore and impossible to tow to Japan. Both are moored in Seletar harbor as floating AA batteries. On 4 November 1944, U-862 departed Singapore, but a drive shaft coupling failed and U-862 had to put about for repairs at Singapore. The next day, U-862 again departed Singapore for the German Monsun U-Boats' new base of operations at Tanjong Priok harbor, Batavia, Java. On 1 January 1945, cruisers ASHIGARA and OYODO arrived at Seletar Naval Base from Camranh Bay, Indochina for repairs. In early 1945, the King George VI Graving Dock was again subjected to Allied air attacks to disable it. On 1 February 1945, the USAAF Twentieth Air Force on Tinian dispatched 113 Boeing B-29 "Superfortess" heavy bombers (Mission 33) to hit Seletar. Sixty-seven aircraft bombed the Admiralty IX Floating Drydock. They hit and sank the drydock and fleet oiler SHIRETOKO berthed in it. 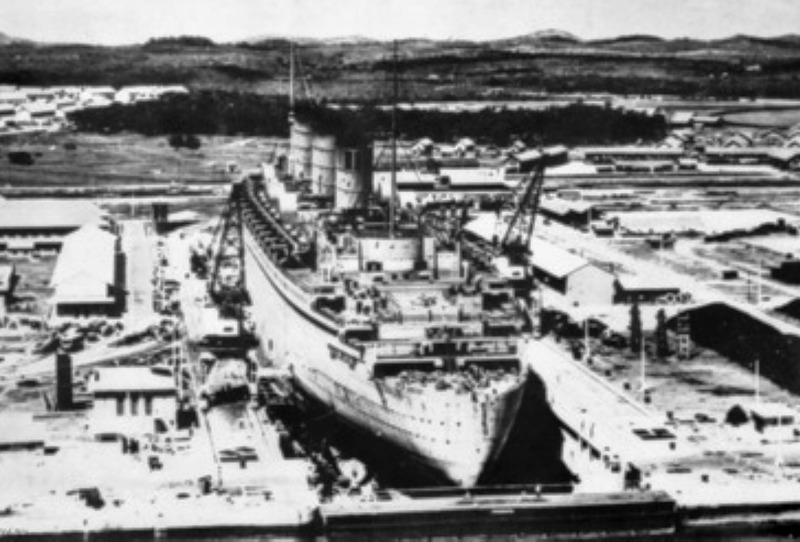 The drydock was not refloated until postwar in 1946. On 20 February 1945, German U-boat U-862 arrived at Seletar Naval Base for an overhaul at the IJN's 101st Navy Repair Facility. U-862 was expected to depart at the end of April and was to load as much rubber as possible and carry eight torpedoes for operations off the SE African coast enroute to the Atlantic, but on 5 May, Germany ceased hostilities with the United States and Great Britain. The next day, Vice Admiral Fukudome Shigeru, Commander, 13th Area Fleet, and staff officers arrived at Seletar Naval Base alongside U-862 and U-181. Fukudome informed the Germans that since Germany had capitulated they are being interned. Later, U-862 was overhauled by the 101st Repair Facility and registered in the IJN as I-502. On 5 April 1945, Captain/Eng Toriyama Yuzo (25) was appointed and as Director of the No. 101 Naval Construction and Repair Department. On 1 May 1945, Captain/Eng Toriyama was promoted Rear Admiral/Eng and served as Director until war’s end. On 2 September 1945, in Tokyo Bay, the Japanese formally surrendered to the Allies aboard USS MISSOURI (BB-63). Immediately following ceremony, United States General of the Army Douglas MacArthur, Supreme Commander for the Allied Powers (SCAP), issued General Order No. 1 for the surrender of all Japanese forces. Ten days later, another surrender ceremony was held at Singapore marking the end of Japanese Occupation in Southeast Asia. For more on Singapore, please see my Special Feature Singapore at War! on Junyokan! For more on this commando raid, please see Peter Cundall's Special Feature Operation Jaywick. Thanks go to Fontessa-san of Japan, on "Axis History Forum" for the incredible amount of work he went to combing through the (Kaigun Jirei Koho) Naval Transfer and Promotion Lists and JACAR to find the Directors of the IJN's Naval Construction and Repair Departments. Thanks also to Sander Kingsepp of Estonia.